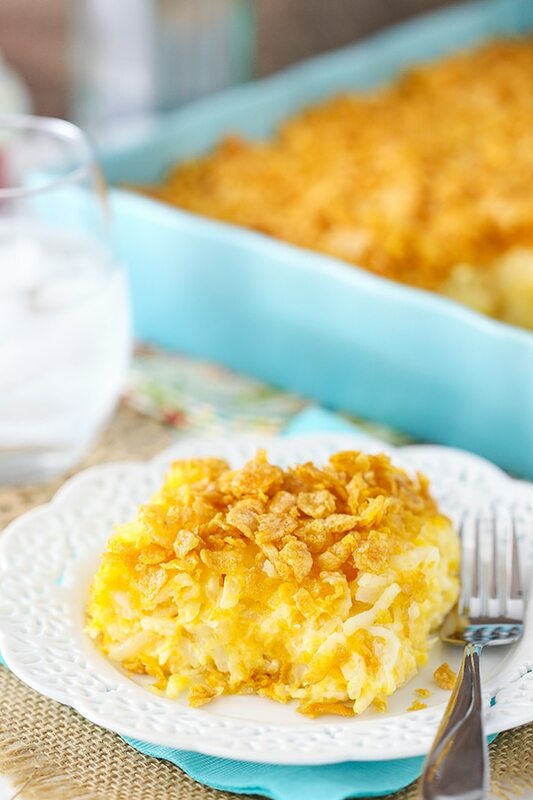 This Cheesy Hashbrown Casserole is one of my very favorite things to make and eat – especially at holidays! The mix of salty and sweet is amazing! Plus, it’s so easy to throw together. I’ve been making this casserole for many years. I first time I had it was when a family friend brought it for Christmas. My mom got the recipe from her and we’ve been making it ever since! 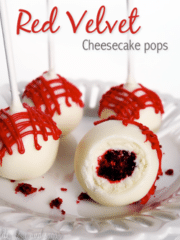 The ingredients are fairly straight forward and readily available, so that’s a big plus. 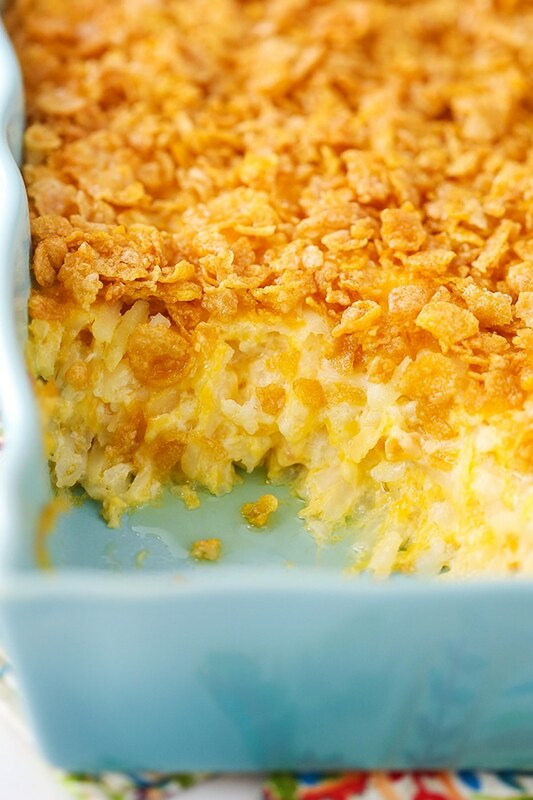 But really my favorite part about this casserole is the fact that it’s sweet and salty. The salty is obviously from the main part of the casserole itself. Cheese, potatoes, sour cream, butter, onion – what’s not to love? The topping is where it’s at though. That’s where the sweet comes into play. 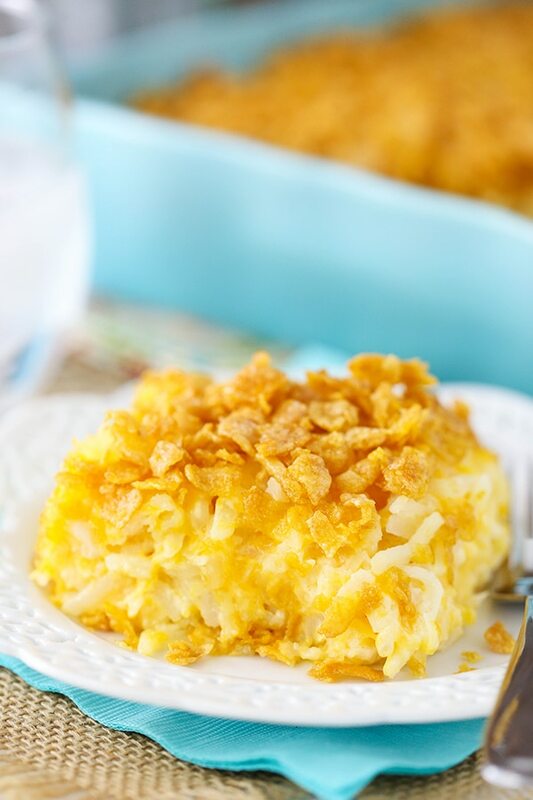 The original recipe called for regular cornflakes crushed up and mixed with butter on top. I did that for a while, but my only problem with that was that after I used the 2 cups of crushed cornflakes that I needed, I still had quite a few cornflakes left over – and I don’t eat unsweetened cereal. Boring! So one day I decided to try Frosted Flakes. That way I could eat the leftover cereal. I have NEVER gone back and I never will. The sweet with the salty is the jam! The more topping, the better! 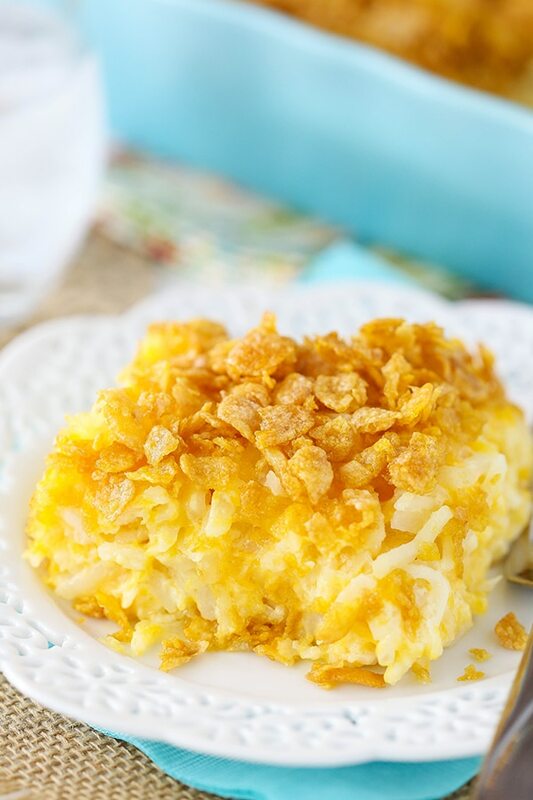 The other great thing about it recipe is that since it’s hash browns, it could totally be a side with a meal, or breakfast. Hello leftovers in the morning! Bring it! I love making this for holidays – Thanksgiving, Christmas, East – you name it and it better be on my table! I’m a big fan and if you give it a try, I know you will be too! 2. 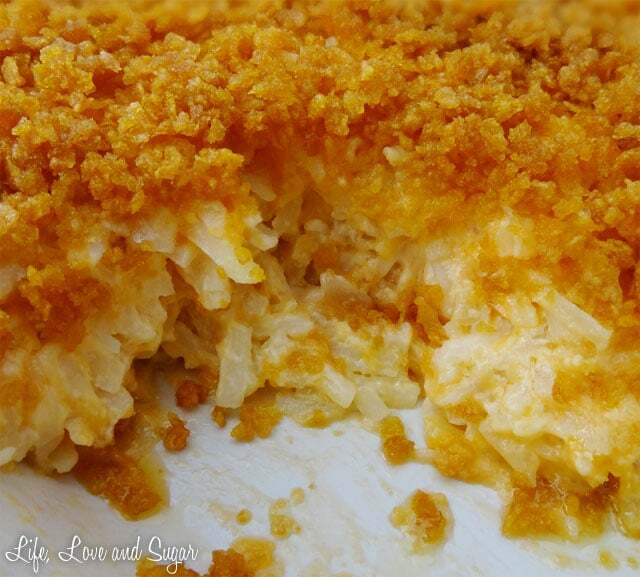 Combine hash browns, cheese, sour cream, salt, onion, soup and 1/2 cup butter in a large bowl. Mix well. 3. Spread mixture evenly into a 9×13 casserole dish. 4. 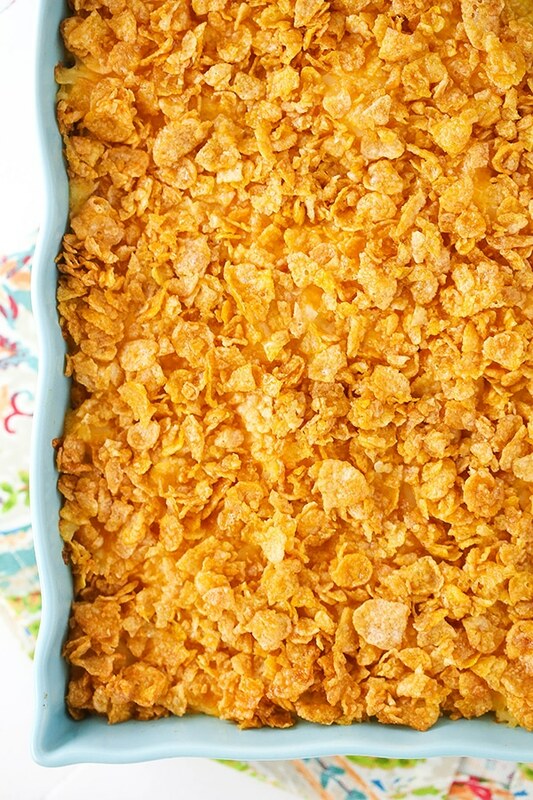 Combine cornflakes and 1/2 cup butter and sprinkle over the top of the casserole. 5. Bake for 30-45 minutes or until heated through. 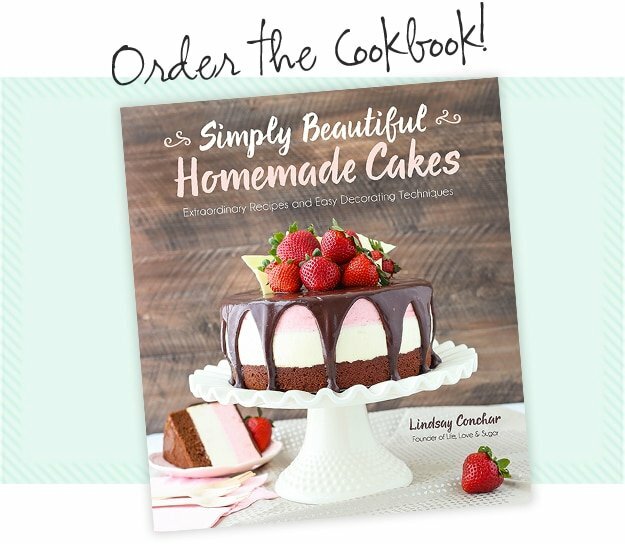 Hi Lindsay, I use this exact recipe except I use crushed Lays Ruffled Potato Chips on the top….I always have to make two for family gatherings because it goes so quickly. Even the leftovers seem to disappear as my kids walk out the door!! Like your site, we’ll be following to see what you’re up to next! Rock on, girlfriend. We will miss you guys this year! just wanted to let you know this recipe is not gulten free…..the cream of chicken soup has wheat flour my sister has celiac and she can’t eat this. ???? You can get gluten free cream of chicken soup. I was able to pick some up at Wal-Mart in the gluten free section. So has anybody used sausage in this recipe? 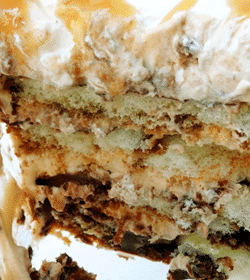 I’ve made this several times, and different…depends on what’s in the cupboard. Thank you so much for sharing this! 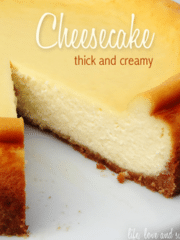 I think this is even better than the original Cracker Barrel recipe ! Curious what everyone’s favorite topping for the crunchy part would be though. 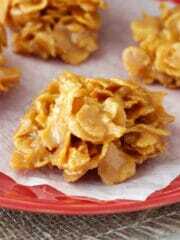 Cornflakes, rice crispie cereal, potatoe chips , crackers?? I’m trying to figure out the best/most liked topping. I also added fresh crumbled bits of bacon and I also added dry ranch mix in the recipe! It adds an extra kick to the meal! I have made this before and it’s very good. I must say though all your ads that come up are annoying. I understand you make money but still annoying especially when I am reading your recipe and an ad for nasty bunions is in the middle of the recipe. Won’t be coming back ????????. I do not thaw the hash browns, I found it was easier to mix with them frozen…I found thawed hash browns tended to get mushy. 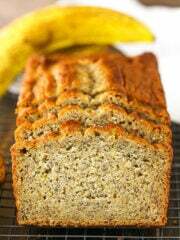 I love this recipe ,so good and sooo easy !! Can you make night before and refridgerate , name it next day? 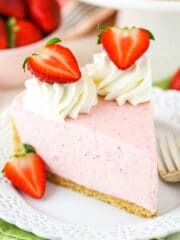 I just wanted to tell you THANK YOU for this recipe! 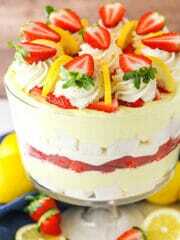 It is perfect and oh so delicious!! You are not only a beautiful young lady, but you are a very talented cook! I’m 62 and could never have cooked like you do. You are an amazing young lady! Keep up the good work! So glad you enjoyed it! Thanks Carol! Could you substitute sour cream with Greek yogurt? 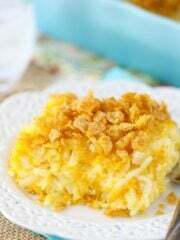 Hi Lindsay, I make a hash brown casserole similar to this. Mine has cream of mushroom soup, sm. can of mushrooms, a sm. jar of pimentos ( I drain some of the juice in the mushrooms and pimentos ). Top with more cheese and it is delicious. But I’m going to try this one too. Have a wonderful day. And Please keep the recipes coming. 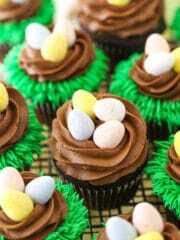 Want to try them ALL..
Hi, just wondering, in your video you do not add butter to the mixture, but in your recipe it says to add it? Is it supposed to be melted or only on the topping? Yes, it’s all melted. Half goes into the casserole, half in the topping. I made this for my wife who is recovering from cancer surgery. 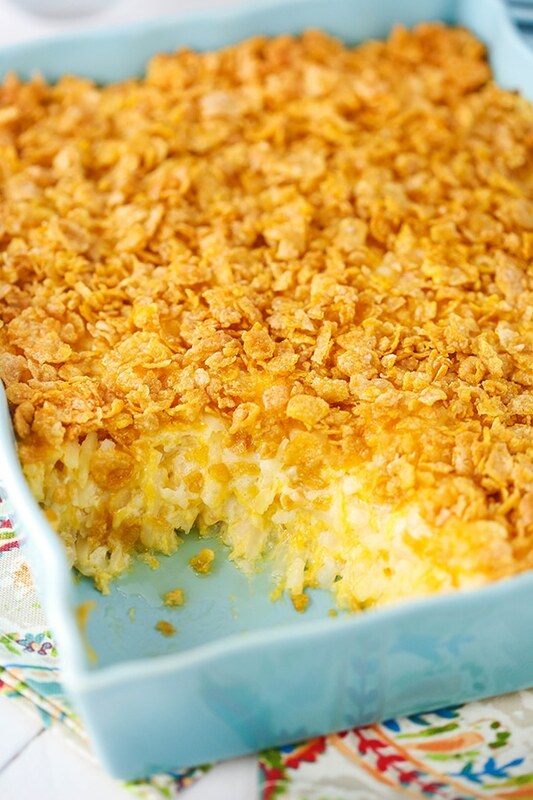 I am challenged in the kitchen but tried this, except I only had cinnamon Frosted Flakes and Laura Scudders green onion dip, that I mixed with sour cream. 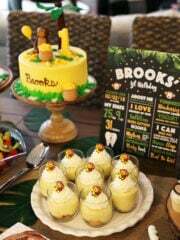 My wife loved it except she recommended a quarter cup less butter and not adding salt if using the dip. 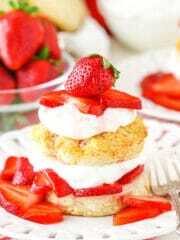 Thank you for helping me do a good dish for her. 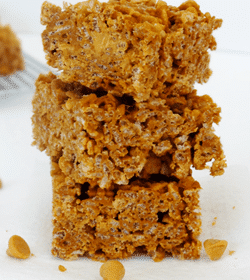 I made a recipe just like this today, and the cornflake topping came out tough/chewy/hard…Any thoughts why this happened? Are you suppose to completely mix the cornflakes and butter together before putting on, or just sprinkle dry cornflakes on top, the drizzle butter over? Thanks for any advice you can give me!